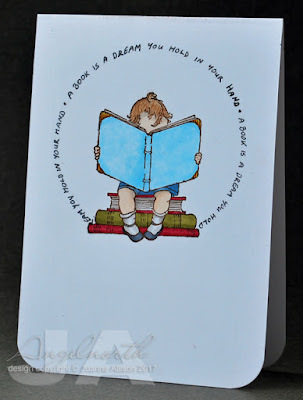 It's International Literacy Day today according to UNESCO - since reading and literacy are close to my heart it seemed the perfect coincidence that it's my turn to set the challenge at Daring Cardmakers. So the challenge is to celebrate the written word - images of books or readers, a favourite literary quote, an author portrait... where will your imagination take you? I've gone ultra clean and simple with this sweet little image and -eek!- my own handwriting. The quote is from Neil Gaiman and I've just repeated it to make a circle round the little reader who is, I hope, lost in the world those words are creating. I'm really happy with the Bristol card I found from a seller on eBay - it's a really good heavy weight for card bases (it's 335gsm) and even the strong shades of Copic marker didn't bleed through so this is a truly one layer card. wow I couldn't believe it when you said it was your hand writing - so neat and it looks just like a stamp!